Ricardo Martinelli, Panama's fugitive former president, has directed his Miami attorneys to move to dismiss his appeal of a Federal court order authorizing his extradition to Panama, to face serious criminal charges. he has been in custody since June, awaiting a final resolution of the extradition process. 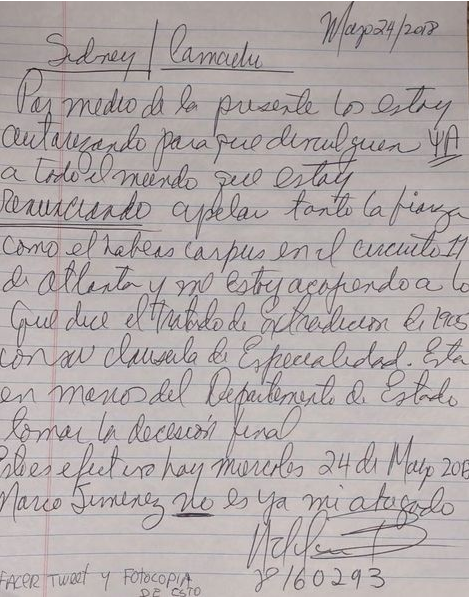 His Panama City Attorney, Sidney Sitton, released to the press this handwritten note to the Eleventh Circuit Court of Appeal, whereby Martinelli has terminated his attorney, former United States Attorney, Marcos Jimenez, and "rescinded" his appeal of the adverse decision. The motion, as filed in Federal Court by his attorneys, is curiously sealed to the public, as was 95% of the court file, leading us to assume it contains sensitive information about Martinelli, and his relationship with one or more US law enforcement or intelligence agencies. Martinelli was allowed to enter the United States after his term as president ended, notwithstanding that he was under criminal investigation in Panama, for multiple offenses. It is still up the Secretary of State, who makes the final decision on extradition requests, to decide whether Martinelli must face justice in a Panamanian courtroom, or wehtehr he may remain in the United States.